explore advancing their careers in one of Asia’s top engineering schools. Improving the nation’s competitiveness and energy security are now crucial to efficient development and use of technology in the future. The rapid increase in energy demand has accelerated the competition to secure energy. In Korea, where most energy resources are imported, the development of energy resources for the future may be the key to determining the nation’s future. The Department of Energy Systems Engineering focuses on addressing this issue by fostering global energy leaders who will develop new, environmentally friendly technology for exploiting future energy resources. 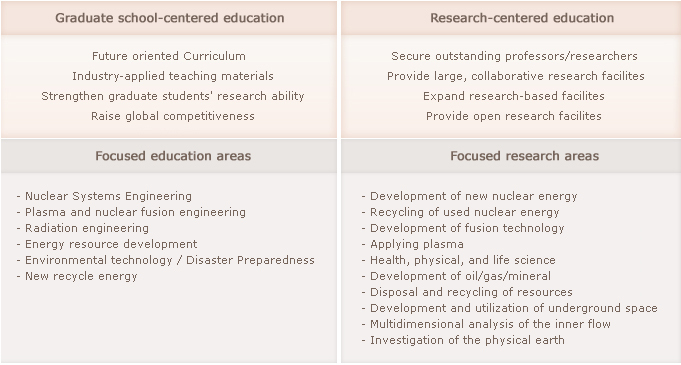 The graduate school course is divided into nuclear engineering and energy resource engineering. The nuclear engineering area studies the technologies for producing nuclear energy, which has the potential to become the main source of energy in the future as well as present times. This area is further subdivided into nuclear power system engineering, plasma and fusion engineering, and radiotechnology. The energy resource engineering area is divided into energy resource development, environmental technology, and renewable energy. The Department of Energy Systems Engineering has completed many studies of fossil fuels and nuclear energy, which supply 95% of the entire energy supply. It also investigates future energy sources such as renewable energy and fusion energy. The education and research opportunities in the undergraduate course offer a chance to develop students’ abilities to conduct research on the core technologies of energy and the environment, eventually fostering global leaders who will contribute to the development of the energy industry in Korea. To achieve this, our undergraduate course offers practical, future-oriented education in large research facilities and other foundational facilities in order to develop students’ talents and ensure global competitiveness. 에너지 시스템 공학부 교과과정 및 구성을 알려주는 표입니다.